Great Alaska Adventures renowned main lodge sits at the confluence of the Moose and Kenai rivers, site of an original homestead in 1947 by Co-owner Kathy Haley's father, Walt Pederson. The The main Lodge where happy hour and all meals was once the dream house with the finest view on all the Kenai. All meals are served inthe main lodge (following our "nearly world famous" happy hour!) 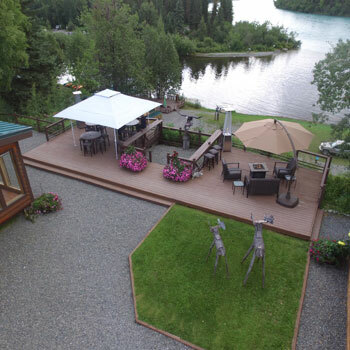 and the individual cabins are spread out on nearly 25 acres of the Kenai's finest riverfront. Our Kenai River Lodge is at the very core of all we do. Overlooking the confluence of the Kenai and Moose Rivers (and an amazing view of the snow-capped Chugach Mountain Range), our legendary lodge is the the envy of every lodge in Alaska. With a quarter-mile of the finest wade fishing on the Kenai River. 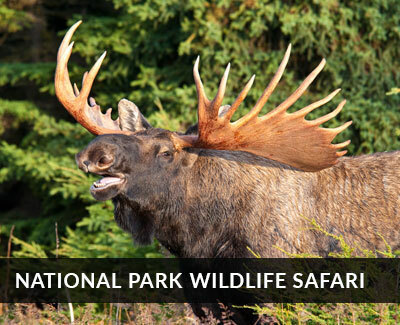 plus direct access to great calm water kayaking and wildlife viewing of the Moose river as well. All rooms have a breathtaking view of the surrounding river and Kenai Mountains. 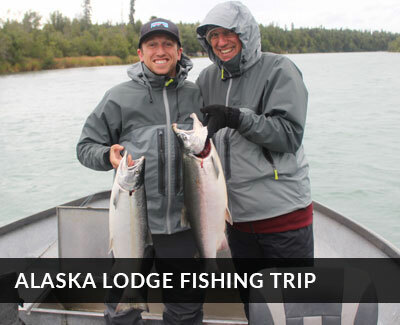 Great Alaska Adventure Lodge is the premier lodge on the Kenai River, and features a spectacular view from the main lodge as well as the 9 separate cabins spread out overlooking the river. Our typical units, with 3, 4 or 6 rooms per cabin, with shared decks overlooking the beautiful Kenai river and Mountains. Room configurations are simple - we have queens and doubles in most rooms perfect for a couple or 2 folks who are not sharing a bed. All rooms have private bath and most have a small fireplace as well. All cabins have a spectacular view of the Kenai River and surrounding Kenai Mountains. Most have their own deck, or a common deck adjacent to your room. Daily maid service is included and we offer a 24 hour laundry service for a small fee, so our guests my pack as lightly as possible. Hair dryers are available for those who request them and all showers have bulk use toiletries to reduce the amount of waste from small disposable toiletry containers. Each morning begins with a knock on the door and hot coffee to start your day. When you return from your days activity, we'll have hot soup, chowder and other snacks in the lodge to tide you over until happy hour, when the chef's wonderful hors' duerves to get you ready for another great dinner overlooking the Kenai River and mountains. Great Alaska is unfortunately not wheelchair accessible. After your days adventures are over, the day is long from done! 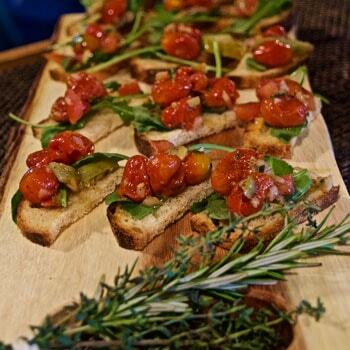 Our "nearly world famous" happy hour is much more than an drinks and appetizers to get you ready for another great dinner overlooking the river (although it's that, too!). It's a chance to meet with the managers and see the plan for your next days activity, and meet with your guide to be sure you are all set for your adventure. He'll help explain your options, help you with how to dress and any other question you might have. Happy hour is just one of the things that makes our all inclusive adventure packages and Alaska fishing trips special. We know that your time off the water or trail is an important component of any vacation experience. 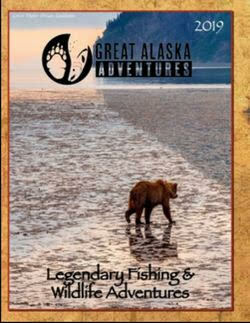 At Great Alaska Adventure Lodge, we seek to provide a comfortable, accessible place away from the "Real world". Our Chef and his staff serve up authentic and fresh American favorites that everyone can enjoy. We are also able to handle Vegetarian, gluten-reduced and some other dietary needs - however there are others we are not able to accommodate. If you have specific dietary needs, please ask your adventure expert on our specific requirements when you are discussing your trip. We serve meals family style, with a single main entree for all. We offer a simplified kids fare if you require that but will work with you to create the best experience we can.